France's second-most important city after Paris is surprisingly undiscovered. Although Lyon doesn't often make it onto tourist itineraries, many cultural treasures await those who take the time to explore the city. 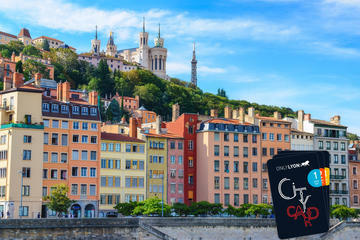 With a history dating back to ancient Roman times, Lyon has earned a place on the UNESCO World Heritage list. The city boasts France's oldest ancient ruins, medieval quarters, and fine Renaissance houses. The atmospheric neighborhoods found along the Rhône and Saône Rivers reflect the city's rich heritage. The Quartier Saint-Jean and Colline Croix-Rousse districts have an enchanting Old World character, while the Presqu'ile exemplifies 19th-century elegance. The happiest of all visitors are the ones who journey here to sample the famous cuisine. France's most renowned chef, Paul Bocuse hails from Lyon. His celebrated three-star Michelin restaurant is a top destination for gourmands. The legendary Lyonnais gastronomy can also be enjoyed all over Lyon at "bouchons," evocative little brasseries. The impressive cultural heritage of Lyon is evidenced in this Musée des Beaux-Arts, considered the next-best fine arts museum in France after the Louvre. At the Place des Terreaux near the Hôtel de Ville (Town Hall), the museum occupies the 17th-century Palais Saint-Pierre, a former Benedictine convent. This museum has one of Europe's largest collections of artwork, including antiquities, paintings, sculpture, and decorative art-from ancient Egypt to the present day. The museum also has an excellent collection of Impressionist paintings and modern art. The quality of the collection is exceptional. There are many renowned works by European masters such as Delacroix, Géricault, Rembrandt, Rubens, Poussin, and Véronèse. Highlights of the painting collection include the medieval altarpiece. Be sure to admire the Baroque statues in the Refectory and Grand Staircase. The museum's café-restaurant, Les Terrasses Saint-Pierre, has a pleasant atmosphere. During summertime, guests may dine al fresco on the terrace in the gardens. Lyon's atmospheric Quartier Saint-Jean is the place to discover the city's Old World ambience. It's a delightful place for a leisurely stroll. This medieval quarter north of the cathedral is filled with narrow cobblestone lanes and quiet little courtyards. Begin exploring around Rue du Boeuf and the Place Neuve Saint-Jean, a picturesque square filled with traditional restaurants. Then wander around the pedestrian streets of Rue Saint-Jean and Rue des Trois Maries. There are many inviting shops and cafés along the way. Continue until reaching the Hôtel de Gadagne at the Place du Petit Collège. This magnificent 15th-century mansion houses two excellent museums. The Musée d'Histoire de Lyon (History Museum) illustrates the history of the city-from antiquity through the Middle Ages and Renaissance up to the 20th century. The Musée des Arts de La Marionnette (Puppet Museum) displays marionettes from all over the world. A short stroll away from the Gadagne museums is Le Guignol de Lyon (2 Rue Louis Carrand), where the Compagnie M.A. marionette company performs. Attending a traditional puppet show is one of the most entertaining things to do in Lyon. Another place to watch a marionette performance is in the Quartier Saint-Georges, at the Théâtre la Maison de Guignol puppet theater (performances are in French; check the schedule in advance). The theater is found in a peaceful square a 10-minute walk away from the Cathedrale Saint-Jean-Baptiste, and a few steps away is the Café du Soleil (2 Rue Saint-Georges), a great place to enjoy an authentic Lyonnais meal. Lyon stands on the site of the ancient Roman city called Lugdunum, founded in 43 BC, which was the capital of Gaul. This superb archaeology museum displays Gallo-Roman-era objects including vases, gravestones, mosaics, statues, coins, and ceramics. The antiquities displayed are from onsite digs (from the city of Lugdunum) as well as nearby Roman archaeological sites of Saint-Romain-en-Gal and Vienne. The collection is renowned for its breadth and variety. Highlights of the collection include a monumental Hercules sculpture, decorative marble work from ancient baths, and a magnificent 100-square-meter floor mosaic depicting images related to the God of Oceans. The museum also extends to the archaeology site that is nearby, about 300 meters from the museum. This site boasts the oldest ancient ruins in France, including two Roman theaters. The Grand Théâtre dating back to 15 BC was where tragedies and comedies were performed. The Odéon was the theater for musical performances. There are also the foundations of a temple that was devoted to the Goddess Cybele. While visiting Lyon, indulge in the famous regional cuisine. The hearty local cuisine features meat dishes and salads. The most unique culinary specialty is something known as "quenelles," a type of dumpling (made with fish) in a rich cream sauce. The most authentic places are the "Bouchons Lyonnais," brasseries that are found all over Lyon. Bouchons are friendly little restaurants that offer a classic French dining experience. Le Grand Café Lyonnais (4 Rue de la Barre) is one of the fancier "bouchon" brasseries, serving traditional cuisine in an elegant dining space. When it comes to more upscale gourmet cuisine, Lyon has a wide selection of offerings. The city has many restaurants with Michelin-star ratings, including the renowned three-star Paul Bocuse Restaurant (40 Quai de la Plage), widely considered the best restaurant in France. Paul Bocuse is one of France's most renowned chefs and has held onto his three Michelin stars since 1965. Paul Bocuse also created the Brasserie le Sud (11 Place Antonin Poncet, near the Place Bellecour) a more casual restaurant that focuses on Mediterranean cuisine. Tourists will also have fun shopping for gourmet food products in Lyon. Chocoholics should make a beeline for Palomas boutique (2 Rue du Colonel Chambonnet), an acclaimed chocolatier in Lyon since 1917, and Boutique Voisin (28 Rue de la République and other locations throughput Lyon), a prestigious chocolate shop founded in 1897. A highly recommended foodstuff shop is Giraudet (2 Rue du Colonel Chambonnet and 102 Cours Lafayette), which sells high-end culinary items; the shop also offers cooking classes. The boutique A L'Olivier (33 Cours Franklin Roosevelt) is a purveyor of the finest olive oils made in France. Also be sure to visit Les Halles de Lyon - Paul Bocuse (102 Cours Lafayette). This famous covered marketplace has 48 different shops and restaurants that offer regional products, including charcuteries, local cheeses, fresh bread, quenelles, truffles, fruits, vegetables, and pâtisserie and chocolate. For hands-on culinary training, take a French Cooking Class at L'atelier des Chefs that will teach you to prepare an amazing three-course meal. Built on the slopes of the Croix-Rousse hillside, this historic neighborhood was an important center of weaving in the early 19th-century. Because of the high gradient of the streets, there are many charming curves and staircases. The most unique aspect of the neighborhood is its collection of "traboules," covered passageways that function as public hallways through the quarters of private houses. These special alleyways were used by silk workers to transport their fabrics. Wander around the neighborhood to discover the architectural curiosities of the winding streets and hidden traboules. There are passageways starting at 9 Place Colbert and continuing to 14 Bis Montée Saint Sébastien; from 20 Rue Imbert Colomès to 55 Rue des Tables Claudiennes; and from 30 Rue Burdeau to 19 Rue René Leynaud (Passage Thiaffait). The traboules are open to the public, but visitors should be quiet, out of respect to the residents. Another tourist attraction in this area is the Maison des Canuts (House of Silk Workers) at 10/12 Rue d'Ivry. This small museum is dedicated to the art of creating silk. During a visit, tourists can discover the invention of the Jacquard loom and watch hand-weaving demonstrations on traditional looms. Lyon's Presqu'ile District is a piece of land, sort of like an island, within the river. This neighborhood is distinguished by its beautiful architecture and monumental town squares. The Place des Terreaux is worth visiting just to see the fountain by F.A. Bartholdi. This grandiose work of art depicts the triumphal chariot of the Garonne River. Notice the four marvelously sculpted horses that look very hardworking, they represent the four different rivers that flow into the ocean. Lyon's Hôtel de Ville (Town Hall) is found on the east side of the square. Originally built between 1646 and 1672, the Hôtel de Ville was rebuilt (after a fire) by Jules Hardouin-Mansart in his signature Baroque style. Another monumental edifice in this area is the Palais de la Bourse et du Commerce, on Rue de la République. Although the building has a Renaissance architectural style, it was constructed in the 19th century. Continuing south of the Palais de la Bourse, tourists will come across the Eglise Saint-Bonaventure, a former Franciscan church built in the 14th-15th centuries. Lyons's finest square in the Presqu'ile district is Place Bellecour, between the Rhône and Saône Rivers. The square's centerpiece is an equestrian statue of Louis XIV created by the Lyons sculptor F. Lemot. Elegant 19th-century buildings line the east and west sides of the square. From the north side of the square, there is a view of the Fourvière hill. A few steps away from the Place Bellecour is the Hôtel-Dieu de Lyon, a splendid 17th-century building that once served as a hospital. Another lovely square, the Place Carnot, is found by way of Rue Victor-Hugo. This square features an immense monument to the Republic created in 1890. Housed in an 18th-century Lyonnais mansion are two superb museums: the Fabric Museum and the Museum of Decorative Arts. The Musée des Tissus (Fabric Museum) is a unique museum that allows visitors to discover the fascinating history of Lyon's silk trade, dating back to the Renaissance period. The collection includes rare fragments of clothing from the 13th and 14th centuries, exquisite tapestries from the 18th century, as well as more modern 19th- and 20th-century pieces. Also on display is a splendid silk dress of the Empress Josephine. Among the most precious items in the collection is a pleated tunic from Egypt's 5th Dynasty era, dating to around 2,500 BC. The Musée des Arts Decoratifs (Museum of Decorative Arts) offers a rich collection of decorative pieces of artwork painted on faïence, paper, wood, and other materials; small religious sculptures; Japanese figurines; Italian majolica pieces; vintage dinnerware; antique furniture; and clocks. The items are displayed in real-life settings to provide cultural context. Some of the museum's rooms feature lavish decor. Visitors feel as if they are taking a peek into a wealthy family's home of a bygone era. During the Second World War, Lyon was known as the "Capital of the Resistance" because of the strength of its struggle against the Nazi regime. The Resistance and Deportation History Centre is housed in the building that was used by the Head of the Gestapo in Lyon. This building is now dedicated to the remembrance of the victims who were held in the building's cellars. The History Center tells the story of the deportees, the hidden children of deportees, members of the resistance, and others who lived through the Second World War. The center has a permanent exhibit that outlines the major events of WWII and focuses on the years of occupied France. There is an audio guide that helps visitors make sense of the historical information, which is presented in videos, photos, and written documents. The center aims to honor the citizens in the resistance and pay homage to the memories of the victims of deportation. It is constantly updating its content and continually seeks out WWII eyewitnesses to share their stories. In a majestic location on the Fourviere Hill, the Basilique Notre-Dame rises to a height of 130 meters above the Saone River. The Basilica is accessible by funiculars running up the hill. This stunning church was built after the Franco-Prussian War when the people of Lyon had vowed to create a Marian sanctuary if their city was spared. The construction took place from 1872 to 1884. The Basilica is a blend of Gothic and Byzantine styles with a richly decorated interior. Spend time in the sanctuary to admire the sumptuous mosaics and paintings. After touring the interior, climb the northeast tower to take in the sensational views of Lyon's cityscape and surrounding areas. Also, the Esplanade de Fourvière, on the left side of the Basilica, provides a sensational panoramic outlook onto the city of Lyon. The views extend to the Croix-Rousse and the Terreaux districts, the Quartier Saint-Jean further down the hill, and the Place Bellecour on the right. Built in the 12th-century, the magnificent Cathedral of Saint-John is renowned for its 13th- to 14th-century stained-glass windows. The large rose window dating from 1392 allows in a kaleidoscope of colorful light. The cathedral is mainly Romanesque with a Late Gothic facade. One of the most interesting features is the astronomical clock created by Nicolas Lippius in 1598. The cathedral also has a remarkable bell (cast in 1622) named "Anne-Marie de la Primatiale" that is one of the largest ever made and is only rung on Catholic feast days. For a good view of the cathedral from a distance, go to the embankment near the Pont Bonaparte. The oldest church in Lyon, the Abbaye Saint-Martin d'Ainay was built in the 11th century on the site of a 4th-century Roman temple. The Abbey church originally belonged to a Benedictine abbey founded in the 6th century. A wonderful example of Romanesque architecture, the church contains four classical columns, a 12th-century mosaic pavement in the choir, and 19th-century gilded paintings by the Lyon artist Hippolyte Flandrin. On the Place de la Comédie, the Opéra de Lyon is an opulent 19th-century opera house with a majestic dome. The original theater was renovated by Jean Nouvel, who tripled the size of the building using modern architectural techniques. The Opéra de Lyon presents a wide variety of opera, as well as dance performances and classical music concerts. The Théâtre des Celestins (4 Rue Charles Dullin) is an impressive Neoclassical theater built on the vestiges of a Celestine monastery. The ornate Italian-style auditorium has a sensational ceiling painting, gilded balconies, and plush velvet seats. The theater offers dramatic performances (in French), ranging from classical repertory to contemporary plays. 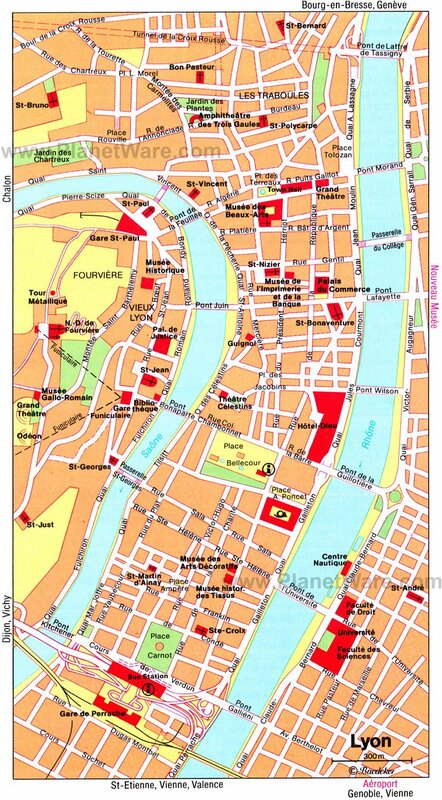 Named for a golden statue of Christ that, according to legend, was buried here by Crusaders, the Parc de la Tête d'Or is in the center of Lyon on the left bank of the Rhône River. This lush and verdant park has a zoo, botanical garden, and rose garden, as well as a lake where families can rent boats to sail around the tranquil waters. Other highlights for children are the Grand Carrousel, pony rides, paddle-boating at the "Petit Lac" ("Little Lake"), and an old-fashioned choo-choo train. The printing press was a revolutionary technology that changed the world, and Lyon was an important center of bookmaking during the 15th to 16th centuries. This museum offers an insightful overview of the history. Exhibits explain graphic printing techniques as well as the cultural effect of printed books. At the Quai Saint Vincent, this 800-square-meter mural features 31 famous people from Lyon, with 25 historical figures and six contemporary figures. The mural was created by the Cité de la Création organization in 1994-1995. Look for Paul Bocuse in front of "Le Pot Beaujolais" restaurant. Luxury Hotels: Convenient to shopping and restaurants, Mercure Lyon Centre Beaux Arts is in the center of Presqu'île, near Place Bellecour and the cathedral. Rooms at Hotel Le Royal Lyon - MGallery Collection overlook a quiet courtyard or Place Bellecour in the heart of Presqu'île, just across the bridge from Vieux Lyon. Between the Saone River and the Beaux-Arts Museum, a few steps from Vieux Lyon, Grand Hotel des Terreaux has elegantly decorated rooms. Mid-Range Hotels: Near the colorful riverside cafés of Quai Saint-Antoine, Hotel des Celestins is in a charming neighborhood of restaurants and shops. Also across the bridge from the cathedral and Vieux Lyon, Hotel des Artistes is opposite the Théâtre des Célestins. Hotel Bayard Bellecour is in a vintage building with a courtyard and appealing retro décor, right on Place Bellecour. Budget Hotels: Near the river, halfway between Place Bellecour and Perrache rail station, the hospitable Hotel Vaubecour is in a neighborhood of antique shops and artisan studios. In the same neighborhood, but closer to Perrache station and the Textiles and Decorative Arts Museum, is Hotel du Simplon. In a prime location just around the corner from the Hôtel de Ville and adjacent to the Beaux-Arts museum, Hotel Saint-Pierre des Terreaux has small, well-decorated rooms, but no elevator. See the City Highlights: To make sure that you see all of the top tourist attractions, take a tour that offers an overview of the city's most important sights. 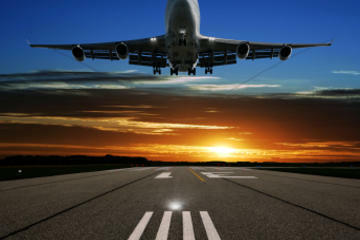 There are several options that cater to visitors with different interests. A good way to see it all is by taking a Hop-On Hop-Off Bus Tour that stop at 13 different attractions, including museums, parks, and historic monuments. For a more customized experience, take the Lyon Guided City Tour by Electric Tuk-Tuk for one or two hours of a private guided tour (with up to six participants) that takes you to Lyon's main highlights: Place Bellecour, the Old Town, and the cathedral, among other places. To experience the charming Croix-Rousse district, take the Lyon City Tram. You'll discover the quaint village-like atmosphere of this lovely area, starting at the Place de la Comédie and continuing with one hour of guided commentary. Explore the Old Town: Wander the narrow, winding streets and ancient alleyways of the atmospheric Old Town and feel as if you are stepping back in time on a 75-minute Storytelling Walking Tour of Old Lyon. Your guide will tell stories of the people who lived here in a bygone era and the power struggles of noteworthy Lyonnais families. You'll learn fascinating historic details, such as the story of a secret Protestant printing press during the Renaissance period and other tales that bring the city's intriguing past to life. Lyon is easily accessible to many of France's top tourist attractions, thanks to the country's TGV (high-velocity) train system. By TGV train, it takes less than two hours to arrive in Paris, while Avignon, in Provence, with its UNESCO-listed 14th-century Palais de Papes, is just over one hour away. Less than 90 minutes away by car, Grenoble is another must-see destination with a charming historic center, top-notch cultural attractions, and gorgeous alpine scenery. The quaint alpine village of Chamonix and the mythic Mont-Blanc mountain in the French Alps are a 2.5-hour drive away. Other picturesque towns of the French Alps, like Chambery and Aix-les-Bains, are just over one hour away by car. The beautiful verdant landscape of the Parc Jura Vaudois in the Jura Region is a 2.5-hour drive away.